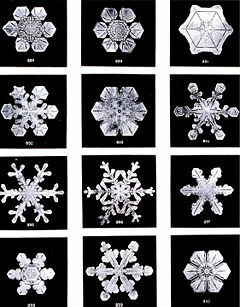 “The photographing of snowflakes, although quite delicate work, can hardly be called difficult, although some hardships attend it, because the work must all be done in a temperature below freezing, and under conditions of much physical exposure. 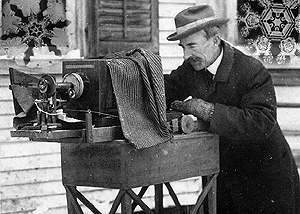 The temperature at which photography is possible depends somewhat upon the thickness of the crystals; this varies greatly from time to time, and depends upon whether the temperature is rising from an intense degree of cold or falling from a point above freezing. If rising after a cold snap, photographing can often be continued until actual thawing commences. Read more here. Or see more on YouTube: really nice quotes from Bentley here. Thanks to the poet Robert Crawford at the TS Eliot prize readings the other night for alerting me to the existence of this fascinating person. I suppose everyone else has known about him all along. You’ve got to catch up sometime.